Hidden New Jersey: Was Santa Claus born in Morristown? Today, as many New Jersey children awake to the delight of toys around the Christmas tree, my own thoughts return to the excitement I felt for the visit that Saint Nick would make to my house. Little did I know that the red-jacketed, white-fluffy-bearded big guy with the bag full of goodies is actually from Morristown. 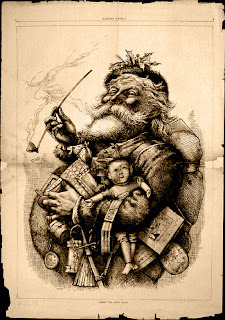 It's no secret that our concept of Santa Claus was cemented in the public eye by political cartoonist Thomas Nast. Few people realize that Nast lived in Morristown for many years, on Macculloch Avenue. Like many New Jerseyans today, Nast was a transplant. Born in Germany, he and his family moved to New York when he was a child, and it was there that he became famous for his politically-inspired drawings. This was before the large-scale use of photography, and good illustrators were essential for magazines to cover the stories of the day. Early in his career, he covered the wars in Italy for publications in New York and London, which made him the logical choice to cover the Civil War for Harper's Weekly. He was a noted voice railing against the corruption of the Boss Tweed political machine that ruled the city after the Civil War, so much so that Tweed's representatives attempted to bribe him to leave the country. Instead, Nast moved his family to Morristown in 1872 and commuted to New York to continue his work at Harpers. His unrelenting attacks so infuriated the electorate that Tweed and his crew were voted out of office, with Tweed eventually convicted and sent to prison. While crusading for what he felt was right and fair, Nast drew likenesses that have become ingrained in American culture: Uncle Sam, the Democratic and Republican mascots, and, of course, Santa Claus. Nast's house is privately owned and not open for tours, but the nearby Macculloch Hall Historical Museum maintains the nation's largest collection of his works. Contributed by his family, the Nast archive includes rough sketches, watercolor and oil paintings, and proofs and drawings in pencil and ink. Students of the artist can also make an appointment to view his personal papers and photos. I'm still trying to figure out whether Nast actually lived in Morristown when he drew Santa for the first time, but I'm not sure it really matters. Like many other notable people we New Jerseyans claim as our own, he lived here for a bit, and that's good enough for me. Although I live near San Francisco now, I was born in Morristown. In his illustrated version of "A Visit From St. Nick," when the children are hanging their stockings the tiles around the hearth are the tiles in the Macculloch Ave. house. And when Santa is up on the roof, the various church spires of Morristown are there behind him. If you Google Thomas Nast images, I think you can find both of these examples of Santa Claus also being a Morristown native. How appropriate that Virginia writes in with such a great fact about Santa in Morristown! Thank you for sharing this information with us, and thanks for reading Hidden New Jersey. I grew up in Morristown and I can remember learning about Thomas Nast as a child. We were always told he "invented" Santa while he lived in Morristown. Excellent! Just the confirmation we needed. I will now claim Santa Claus among noted New Jerseyans.